Footsteps is a practical pedestrian training scheme for young children, which develops awareness of roads and helps them live safely with traffic. Children are taken into the local area with a trained tutor to observe the traffic and discuss road safety. It forms part of the portfolio of pedestrian training programme New Journey, which includes First Steps for pre-school children and Making Tracks which is aimed at children moving on from primary to secondary school. The 1994-98 average number of children killed or seriously injured (KSI) on the roads of Great Britain was almost 7,000 per year. 20% of accidents in 5-9-year-olds and 40% of accidents in 10-14-year-olds occur on journeys to and from school. In 2010 the average number of child KSIs had reduced to 2,502 per year. This could be due to the introduction of training programmes like Footsteps. Road Safety Lesson plans are available to support Footsteps Training. You may also like to invite Gist Ltd to come along to your school to deliver their Child Road Safety Programme. 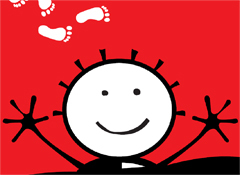 Schools should appoint a Footsteps Co-ordinator to organise Tutor Training and arrange the children’s training sessions. Tutors can be parents, grandparents or Learning Support Assistants, even teaching staff if they have the time. They must attend a Tutor Training course, organised by the Transport Strategy Team at Bucks County Council. The course lasts up to 1 ½ hours and takes place at two venues, County Hall, Walton Street, Aylesbury and Council Offices, Eastern Street, High Wycombe, each term. Training is free of charge to all schools, nurseries and children’s centres. Places are limited on all courses. They will be available to book at the start of each term. Schools usually train children from Year One or Year Two – depending on how many Tutors are available. Each child will take part at least twice a term. Certificates can be awarded once a stage is completed. These are free of charge and can be ordered from the School Travel Planning online shop.